This is Part 2 of our investigation into Twitter’s reorganization. Check out Part 1, where we explore why Twitter appointed its CFO to oversee marketing, and look out for Part 3 on this blog. In Part 1 of our investigation, we looked into Twitter’s curious appointment of their CFO, Anthony Noto, to oversee marketing. We learned that Noto’s finance background will bring a more focused emphasis to return on marketing investments (ROMI). The challenge this creates for marketers is to figure out: Which marketing medium will bring high returns? How can you measure and prove these higher returns to top management? Let’s go back to the word cloud of themes around ROMI, which we generated using ScribbleLive Insights. The four themes that stand out are email marketing, content marketing, marketing automation, and leveraging technology. Technology specifically has been playing an increasingly important role in marketing. Scott Brinker of Chief Marketing Technologist Blog published a supergraphic in early 2015 that detailed the different spheres in the marketing technology landscape, and he found that in just one year, it had doubled in size to nearly 2000 companies! A word cloud of the themes surrounding Return on Marketing Investment (ROMI), from opinions posted between April 9th, 2015 to June 8th, 2015. Brinker also made an interesting observation: he hypothesized that content marketing “is the engine of the marketing technology landscape”. We decided to investigate this trend towards content marketing using ScribbleLive Insights. Content marketing has been getting consistently high attention with fairly positive sentiment in the period of analysis. 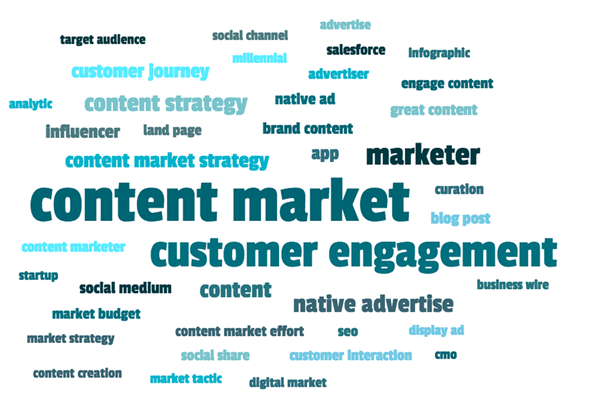 The word cloud of themes around content marketing includes customer engagement and having a content strategy. We compared the amount of attention content marketing has been getting to the other marketing mediums, and we found that content marketing comes third, behind only social media marketing and search engine optimization. A plot of active attention, opinion volume, and sentiment of Content Marketing from March 28th, 2015 to June 22st, 2015. A word cloud of the themes surrounding Content Marketing, from opinions posted between March 28th, 2015 to June 22nd, 2015. Let’s take this one step further. ScribbleLive Insights determines who is influential for a given topic by analyzing reactions on the web -- quotes, comments, likes, shares -- and how significant the reactions are. 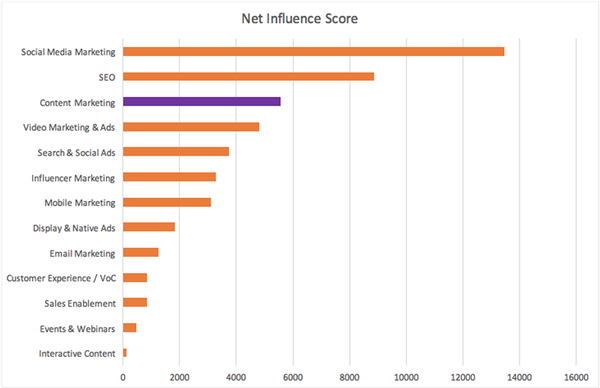 Based on this, we found that there are 660 people who hold some influence in the content marketing space, so let’s investigate this: in what other spaces are these 660 people influential? 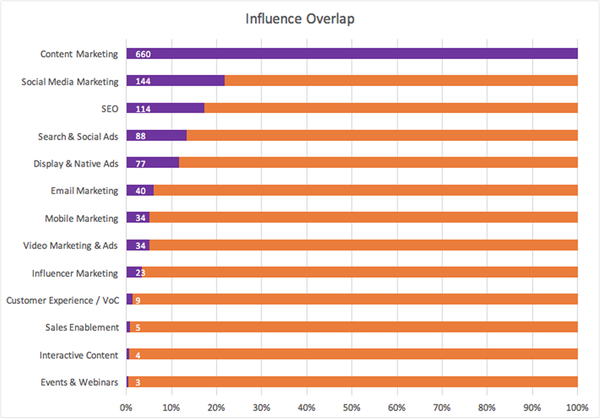 It turns out that 22% of content marketing influencers are also influential in social media marketing, and 17% are influential in search engine optimization. We think this is a strong indication that Scott Brinker’s hypothesis, that content marketing is behind the growth of the marketing technology landscape, is correct! What does this mean for marketers? Well, let’s take a second to summarize what we’ve learned so far. We saw that Twitter appointed its CFO, Anthony Noto, to oversee marketing. When we learned that CMOs are increasingly thinking about return on marketing investment (ROMI), we realized that Noto can bring a much more rigorous ROI perspective to marketing. An important consideration for ROMI is leveraging technology, and when we analyzed the marketing technology landscape, we found that there is a trend towards content marketing that is backed by data. So the question that remains for us to answer is: How can marketers drive a higher return with content marketing? Join us for Part 3 of this discussion on Monday, July 20th as we share some knowledge on how this can be done.